Acceleration and Gravity complete... Traversal of slopes is next! So yeah, the title pretty much says it all. The player has a slight acceleration to velocity on the x axis. This will be useful for future enemies and such... with varying degrees of acceleration and max speed, there will be more options for enemies. Also, now jumping and gravity is complete, and works flawlessly -- I'm very pleased with how well it turned out. The character's jump height and jump force are variable, which allows me to create enemies in the future that jump differently than the main character. 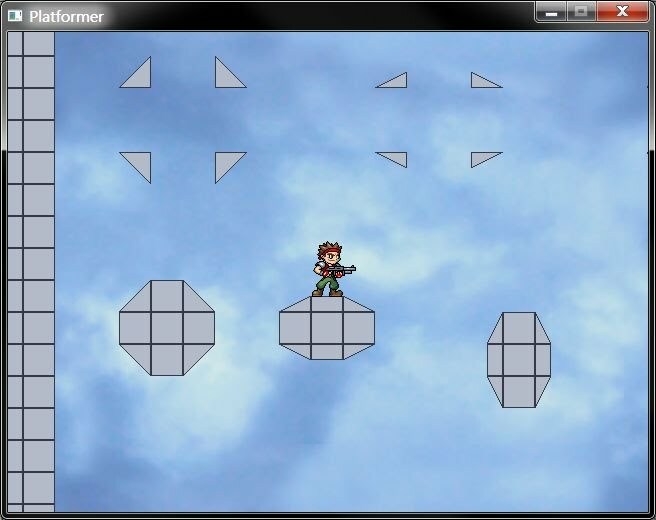 The main character's movement will be the base for many of the enemies in the game. The entire game's gravity is variable as well, and it will effect all objects in the same way, with the same force, as in real life (gravity has the same effect on all objects, no matter the mass). Now, with functioning jumping, acceleration, player movement and controls, and perfect collision detection, I am now working on getting the player to move up and down slopes seamlessly, so as to keep the character's movement flowing with the terrain-- without modification, the character, when running right, would collide with a slope and stop, as he couldn't move right anymore. When I get it working correctly, the character will run up the slope as one would in real life with a gradual terrain change-- you wouldn't jump up it. Once this is done, basic player movement will be complete. I'll post a video of the basic player movement once it's working properly. Note that there is room for much more detail now. Anyhow, yes, working on slope traversal now. Video to follow.